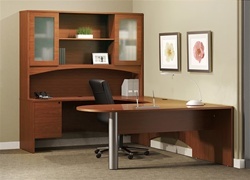 A U shaped office desk helps to maximize the square footage potential of any space. Desks of this nature are composed of a main front piece with either bow front, straight, or peninsula section. The focal desk is highlighted by an attached return and rear credenza to form the full U shape design. As the most popular style of executive desking solution on the market, you'll be at no shortage of models to choose from. Luckily, this post highlights the best of the best for your workspace! First up, the Brighton BT23 Typical by Mayline. This popular configuration features a glass accented hutch, ample storage, and peninsula front desk that combine to create a stunning modern office. Priced at $1129.99, this unit is truly an excellent value! 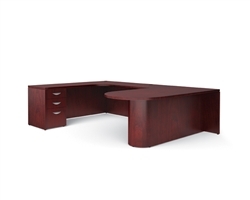 Both the cherry and mocha finishes compliment well in executive environments. As an added bonus, the Mayline Brighton series is typically in stock for those in need of new products in a hurry! 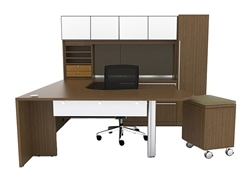 Second on the list of top 5 U shaped executive desks is the Affirm configuration by HPFI. This station includes 4 pieces for the $2615.99. While this might be a bit pricey for the average consumer, the Affirm collection is designed for high end work atmospheres with luxury style. The honey cherry and rouge mahogany finishes boast success and class while the bow front desk portion offers a traditional look sure to earn your space a host of positive compliments. Those unfamiliar with HPFI office furniture should definitely take a peek at the Affirm and Atlas collections as they truly create beautiful work environments to be proud of! When it comes to corner office desk configurations, using a U shaped design is always a great choice! Manufacturers like Cherryman Industries specialize in quality desk sets designed to fit in corner and small office spaces while still offering a cutting edge look that doesn't sacrifice valued professional qualities. Lines like the Cherryman Verde Series offers some of the most cutting edge modern office desks for sale on the market today. Pre configured furniture packages like the Verde VL-745R U station even include a matching mobile pedestal with choice of 3 fabric cushion options. These little add on packages make for a space saving guest seat that also provide versatile office storage. The white glass accents are definitely the main style attribute of these stations. Available in your choice of 2 finishes, Verde sets are amongst the top selling business office furniture solutions of 2013. You can never go wrong with Offices To Go desks and chairs for the home or business. This line of discount office furniture includes a variety of stunning U desk sets and accenting leather executive chairs sure to highlight any office on a strict budget. 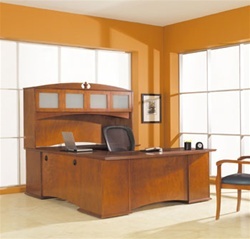 Units like the Ventnor executive desk package offer a choice of 2 color options to meet your stylistic needs. Excellent desk storage pedestals are included in most OTG suites that lock for added workplace security. Stunning edge details and well made surface grommets make for a well rounded collection of executive office desks for sale that won't let you down! Last but certainly not least, if you're looking to impress with modern style, the Mayline executive desks for sale from the popular Napoli collection will definitely do the trick! This line of modular workstations combines glass, wood, and metal accents to form an industrial yet commercially influenced modern line of products that really impress. Units like the NT31 Napoli Typical are an excellent example of Mayline's industry leading craftsmanship at it's finest. High grade American hardwood veneers and Italian influenced design qualities make for a cutting edge look that can't be denied. Choose from three popular finish combinations with plenty of executive cabinets and storage products to complete your space.